Indigenous Amazonians from Peru and Brazil have joined together to stop a Canadian oil company destroying their land and threatening the lives of uncontacted tribes. Hundreds of Matsés gathered on the border of Peru and Brazil last Saturday and called on their governments to stop the exploration, warning that the work will devastate their forest home. The oil giant Pacific Rubiales is headquartered in Canada and has already started oil exploration in ‘Block 135’ in Peru, which lies directly over an area proposed as an uncontacted tribes reserve. The Matsés number around 2,200 and live along the Peru-Brazil border. 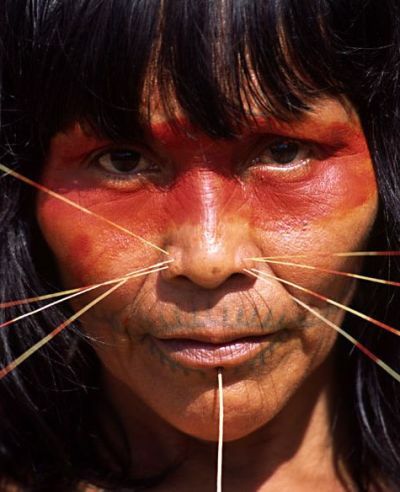 Together with the closely-related Matis tribe, they were known as the ‘Jaguar people’ for their facial decorations and tattoos, which resembled the jaguar’s whiskers and teeth. The Matsés were first contacted in the 1960s, and have since suffered from diseases introduced by outsiders. Uncontacted tribes are also at extreme risk from contact with outsiders through the introduction of diseases to which they have little or no immunity. Despite promising to protect the rights of its indigenous citizens, the Peruvian government has allowed the $36 million project to go ahead. Contractors will cut hundreds of miles of seismic testing lines through the forest home of the uncontacted tribes, and drill exploratory wells. The government has also granted a license for oil explorations to go ahead in ‘Block 137’, just north of ‘Block 135’, which lies directly on Matsés land. Despite massive pressure from the company, the tribe is firmly resisting the oil company’s activities in their forest. The effects of oil work are also likely to be felt across the border in Brazil’s Javari Valley, home to several other uncontacted tribes, as seismic testing and the construction of wells threaten to pollute the headwaters of several rivers on which the tribes depend.